I am constantly amazed at the prices charged for Japanese food in London. I am usually disappointed by the portion sizes, too. That doesn’t make a positive gastronomic statement, in my book. 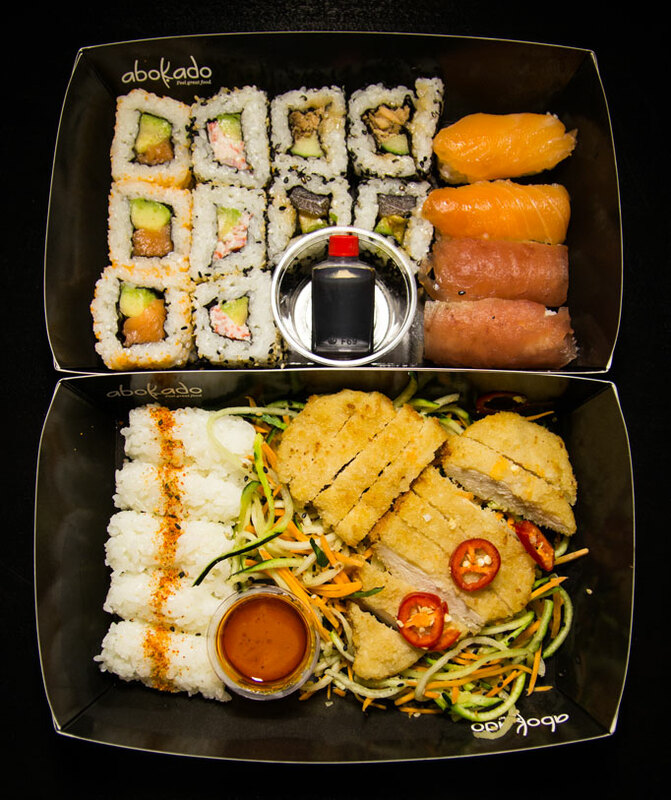 But then there is always Abokado – they offer reasonably-priced Japanese food and plenty of choice. Abokado is a small chain and I have previously visited for breakfast (read my review here). But it was dinner time and the rain was falling like stair-rods. We each wanted different meals, but we both wanted Japanese that wouldn’t demand a second mortgage or have us ordering a pizza after. Abokado fitted the bill. I ordered the Deep Blue which was a generous platter of Salmon maki, California rolls, teriyaki salmon maki, tuna maki and superior salmon nigiri, with a separate bottle of soy sauce and a sachet of vibrant and sinus-burning wasabi for mixing to one’s own taste. This constituted a satisfying meal along with a bottle of Ginger and Lemon Water. My companion, a man famed for having a pair of hollow legs, found his dinner bento equally satisfying, with no temptation to call the delivery moped. He had ordered the Chicken Katsu Salad of breaded chicken fillets along with spinach and courgetti salad, shichimi dusted nigiri, and a tub of sweet chilli and sesame dressing. This worked rather well with the meat. These small cafés sometimes have seating, and they do healthy and tasty food that won’t break the bank. I am now a regular. Looking at Coconut Chicken Ramen Soup for next time.